At McGarity and Efstration, we understand that dog bites typically involve a family member, friend or acquaintance. This fact can make it awkward for you to pursue available legal remedies, so we handle your case with consideration. Our first step is to negotiate on your behalf with the dog owner or insurance company. If not successful, however, we are prepared to take your case to court to obtain the full and fair compensation you are owed for your damages. Unreported dog bites. Many victims of dog bites do not report the incident. Unfortunately, the failure to report a bite may lead to the attack not being taken seriously and to future bites. Minor dog bites. Minor bites involve injuries that have no lasting physical effects, such as bruising, scratches or punctures from a dog’s tooth or nail that requires no treatment or a minimum amount of treatment. Serious to severe dog bites. Serious to severe bites involve an attack that results in multiple deep punctures, lacerations or avulsions requiring suturing or surgery, and which may require hospitalization. This type of injury also includes less serious bites that have become infected and require hospitalization. Fatal dog bites. Fortunately, even though they receive much publicity, fatal dog bites are rare. If you or a loved one has been bitten by a canine or other animal, our seasoned legal team can help you determine your damages and offer information on possible remedies. It should be noted that just because a dog is certain breed does not mean that’s the cause of a dog attack. Most aggressive canines become that way as a result of negative human contact, and at McGarity and Efstration, we thoroughly investigate the various factors that contributed to your incident. If you or a loved one is bitten, you immediately should seek medical attention. Contacting a personal injury lawyer in Atlanta to represent you with seeking your legal remedies is also in your best interests. Is the owner responsible when a dog bites? Georgia law imposes strict liability for injury to a person by an animal considered “vicious” or “dangerous.” The victim must show that the animal was at large due to the careless management of the owner and that the victim did not provoke the animal into attacking. Thus, it is important for a dog bite victim to seek legal assistance with making a claim for recovery after an attack. 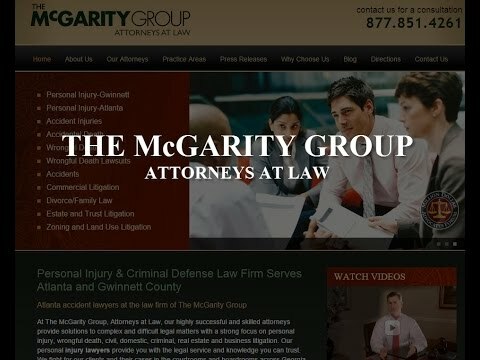 Our legal team can advise you if you meet the requirements under Georgia law to recover fair compensation for your injuries. If you are the victim of a dog bite or other animal attack, our attorneys at McGarity and Efstration are prepared to help. Contact us at 877.851.4261 or online to schedule your free initial consultation. We work on a contingency fee basis, which means you pay no fees or costs unless we recover on your behalf.